Luxury beach house in Worthing on the West Sussex coast with private hot tub and direct beach access, ideal for large groups of 12 as there are 6 en-suite bedrooms. 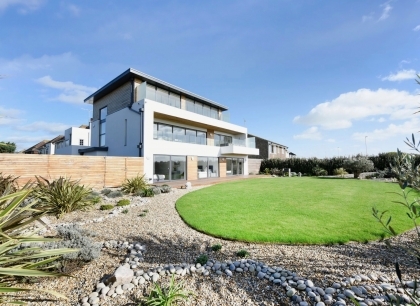 Set in an unparalleled position on the West Sussex coast with far reaching sea views this beach house is set in a truly stunning position with panoramic views along the South Coast. The house is interior designed by a leading London designer and has been finished to a very high standard and has a contemporary and relaxed feel. There is a really relaxed vibe to this beach house and is perfect for a family summer holiday or wind down weekend. The house also has a disabled lift for a wheelchair and 2 carers, 4 bedrooms are ground floor opening onto the garden. All suitable for wheelchair users. Available for week long, mid week or weekend luxury breaks this house is owner managed so for all enquiries regarding suitability, availability and rates please make an enquiry to the owner direct.